WordPress vs. Ghost – Which Blogging Platform Is Right For You? In 2012 John O’Nolan–designer, developer and former deputy head of the WordPress UX team–published a radical new design concept. It was original, elegant, simple, and made instant waves in both the WordPress community and the wider blogging community. The concept was for a new blogging platform he called Ghost. The buzz lasted throughout the ensuing months, through the Kickstarter campaign that made his concept a reality, and then slowly fizzled out during the actual development of the product itself. It seems that everyone is waiting to see if the new platform will live up to the high expectations it debuted with. And if not, then perhaps to let their enthusiasm die a subtle, unnoticed death. But of course we can’t let that happen. So let’s talk about Ghost now. Today. How it currently compares to WordPress and what the future of these two platforms might have in store for us. After all, Ghost has been hailed as a “WordPress Killer”, the “new direction of blogging”, the “first exciting thing to happen to blogging in years” and much more. All of this high praise begs the question: is it true? Is it the next big thing for blogging and online publishing in general? Will it supplant WordPress as the best and most popular blogging platform in the world? These questions, and perhaps a few more, are what this article is all about. Where possible, I’ll try to provide both answers and commentary concerning this developing narrative. We will talk about how Ghost came to be, how it stacks up against WordPress, some of the pro’s and con’s of each, and of course why all of that matters to both serious and casual bloggers alike. Firstly, for those not familiar with the ongoing “WordPress vs Ghost” narrative, let’s take a look at the birth of Ghost, so that we can understand how the frustrations that gave it birth are what will continue to direct its impact on WordPress, blogging, and the larger world of digital publishing. As I mentioned above, it was in 2012 when John O’Nolan published a page on his website that outlined his idea for a new blogging platform called Ghost. As an avid blogger and professional designer of blogs, he was more than a little tired of the undeniably clunky WordPress UX and it’s increasingly distant prioritization of blogging. In this initial proposal Ghost was meant to be a simple fork of WordPress (echoing the way in which WordPress itself came to be, as a fork of another platform called b2) in order to create a sort of “back to basics” or “WordPress lite” blogging platform. Or in other words, to create a platform headed in the opposite direction WordPress has been headed for the last several years. That of a fully fledged CMS, and even more recently, a web OS. O’Nolan’s basic premise was that if WordPress is moving away from being the best blogging platform in the world to the most flexible and easy to use CMS (and ever onward), then that means there is a product gap that needs to be filled. Something just for blogging, without any need to be a fully functioning website, but more powerful, open and elegant than current platforms like, say, tumblr, medium or Svbtle. His pitch in 2012, for a product that did not yet exist, was accompanied by several gorgeous design mockups that completely re-imagined what a blogging platform’s backend should look and feel like. From a beautiful dashboard to simple post creation and management, it was immediately apparent that O’Nolan had a much “sexier” and simpler version of blogging in mind than WordPress is known for. But not just for the sake of aesthetics alone. The UX concepts really did (and still do) have the potential to make blogging itself better for the blogger. The response to the Ghost concept designs were overwhelmingly positive and helped launch a wildly successful Kickstarter campaign that garnered over £100,000 in under 48 hours. In the end, they made £196,362 (or about $320,000). This response, mainly birthed out of existing WordPress users, sent a clear message to both Automattic (the company behind WordPress) and the folks at Ghost. That message being: this project has resonance; people want it and they’re frustrated with the status quo. But what exactly do they want? The sexier UI? The renewed focus on blogging? The simplified experience? An outlet for frustrations they would never otherwise act on? Or some amalgamation of all-of-the-above? In the next section we’ll take a look at the key differences between these platforms and the companies behind them so that we can try to answer those questions more completely. At this point I think it is important to note the biggest distinction of all, which is that while both of these platforms either started or are strictly concerned with blogging–they have fundamentally different goals. When we look at those first, the rest of the differences between the two make more sense and we get a better idea of what their current relationship/dynamic is and how it might play out in the future. To be a beautifully designed, free, open source platform dedicated to one thing: publishing. Already you can see that WordPress is simply not content with being “just a blogging platform” while Ghost wants to be exactly that. With that in mind, I thought that one of the most interesting slides of Mullenweg’s 2013 State of the Word was this survey result. Just 6% of the WordPress users surveyed use WordPress for blogging alone–whereas Ghost, again, does nothing else. Either bloggers have more complex needs than they used to or those who want a simpler experience are going somewhere else. From this slide at least, it seems possible that O’Nolan was spot on when he said there is a product gap for just a blogging platform. Or, and this is a big “or”, perhaps what WordPress has learned over the last decade is that many bloggers–whether they want it at the beginning or not–eventually desire to grow their blog into a fuller site? More on these questions at the end. 1. Non-Profit vs For Profit: I mention this one first because with this difference there is an implication that the for-profit status of Automattic is in some way holding WordPress back and/or preventing it from offering the best product possible to end users. That’s about as fundamental a difference as you can get. Personally, I’m not sure what to make of this insinuation because I have always been blown away with what WordPress has made possible. That said, O’Nolan has been a contributing member to the WordPress product itself and I’m sure he has his reasons for believing a non-profit is a better vehicle for innovation. In general, I think this move is indicative of O’Nolan’s “if I could make WordPress from scratch now, knowing what we know from the last decade, how would I make it better?” mindset. Whether we all find it to be true or not, he certainly feels that beginning with a non-profit will set Ghost up for a more honest and pure relationship with both end users and publishing as a concept. For a full comparison of the two, see this wiki article or this stack overflow discussion for a summary and some other links. There are good reasons for both licenses and it is safe to say that both WordPress and Ghost feel strongly about their choice. Only time will tell whether one gives a definite advantage over the other. 3. Node.js vs PHP: WordPress has, for better or worse, been built using the coding language PHP. While this language has been popularized as a great “hacking” language that is good for rapid prototyping and quick iteration, it has also been criticized as difficult to scale, constantly changing, and prone to semantic errors–among other things. Ghost’s response to this reality was to skip their original idea of forking WordPress and start from scratch with Node.js. 4. Simplicity vs Flexibility: For years WordPress has been plagued with the legitimate gripe that its admin was overly complex and difficult for new users to use and navigate. Advanced WordPress users on the other hand have long been fans of the incredible flexibility this has offered them in crafting the exact website and publishing experience they’re after. Ghost, on the other hand, wants to strip most of the “bells and whistles” away. Baking the essential blogging features such as SEO optimization, social sharing, and other essential plugin functions right into the core. Resulting in very little configuration and an experience that, again, puts the focus on you creating and publishing content. 5. Content Management: WordPress has gone from standard blog posts to posts/pages, custom post types and of course post formats. Managing them all requires you to jump between menus and preview modes for each individual post, page or type. As it stands in WordPress 4.0 these features are a strength instead of a weakness, except perhaps the lack of multi-panel previewing on the backend. Other than that, having your blog posts, pages, and post types in separate places makes sense and the archive structure and search features have improved over the years. 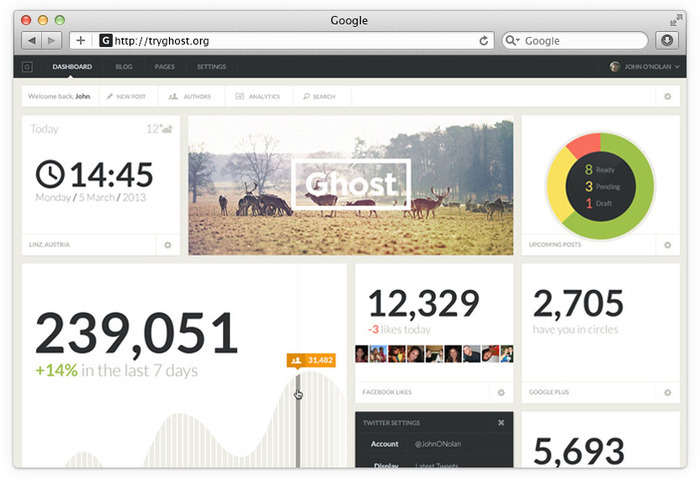 That said, Ghost has at once simplified content management and made it more visually appealing. Ghost makes use of a split screen design, reminiscent of an email inbox, with a post archive on one side and a full post preview on the other. This allows you to browse through your posts (in a meaningful way) much quicker and easier than the current WordPress archive allows. And if you decide a post needs editing (or you’d like to create a new post altogether) you are brought to a similar split screen post editor. 6. Content Creation: Perhaps one of the biggest differences between the two platforms, particularly in their blogging experiences, is Ghost’s split screen writing environment. It uses Markdown to create non-stop seamless formatting as you write. This innovation is one of the most exciting things about the new Ghost platform and a clear example of how its stated purpose of focusing just on blogging is already making a difference for users. 7. User Management: Speaking of users, the next big thing that Ghost does differently from WordPress is attempt to tackle the unique challenges of managing a multi-author blog right out of the box. Sure, WordPress has the ability to add users and assign user roles, but what Ghost is trying to do specifically is provide baked-in newsroom functionality for multi-author blogs and online magazines. Of course these are features that are available to WordPress users now via various plugins, but beginning with a well designed, native system for managing a large writing staff would be huge for the future of online publishing. I say future because at the moment this feature is not very fleshed out on Ghost as their initial focus is small, personal blogs. However, this is one of the features they seem to be most passionate about developing. 8. Dashboard: Perhaps one of the biggest drivers of passion for the Ghost project has been their vision for a new Dashboard. Traditionally, the WordPress dashboard has been one of the uglier, clunkier pages of wp-admin. O’Nolan stood this trend on its head by arguably making the Ghost dashboard the most attractive and feature rich page of the whole backend. He does this, in part, thanks to his philosophy of simplification. By removing the need for extra plugins that provide the desired dashboard widgets nearly every blogger is going to want, they instead baked all that right into the core, allowing Ghost to provide the appropriate dashboard widgets–displaying important social data, post analytics and other important bits of data every blogger wants to know–decked out in beautiful design. 9. Mobile: WordPress has been making decent progress in mobile for the last few years via their apps for iOS and Android. Ghost on the other hand seems to be taking a web app approach that works strictly through the browser. Having tried both, I think Ghost has a long way to go before its mobile browser experience is anywhere near as good as a native app. 10. WordPress.com vs Ghost(Pro): Both Automattic and the Ghost Foundation provide a hosted version of their blogging platform as a means of monetization. The major difference between the two however is that Automattic’s WordPress.com is essentially a massive WordPress multi-site install where as Ghost(Pro) is more like a managed WordPress hosting environment. Think WordPress.com but with all of the flexibility (themes/plugins/etc.) of a WordPress.org install. Down the line, when the Ghost platform and ecosystem are more mature, this could prove to be a massive advantage. 11. Marketplace vs Directory & Ecosystem: Speaking of business advantages, Ghost also seems poised to benefit from a centralized marketplace as opposed to the widely dispersed WordPress ecosystem of free/premium themes, plugins and services. By making all Ghost products (whether free or premium) available in one place they set themselves up to exert more control in this area than in any other. The WordPress community, knowing that Automattic is a for-profit company, might have serious misgivings about this sort of setup. However, with Ghost being non-profit and re-investing everything back into the platform, it makes sense to create a tighter more optimized sales funnel on the main site. Perhaps “better” is the wrong word. Again, these platforms have different purposes and we therefore cannot compare them in every aspect. Ghost will never be about building great websites or web apps, so comparing the two as a CMS, for example, would be pointless. However, now that we understand the primary differences that set these platforms apart as a tool for blogging, we can begin making judgements about which is better suited for particular types of bloggers. 1. Which platform is best suited for just bloggers? In the long run I’d say this category of user will most likely go to Ghost. Which is probably why we’ve seen such a drastic response from WordPress over the last year. I think the WordPress community (and particularly the folks over at Automattic) realize that Ghost has significantly upped the expectations of users when it comes to a beautiful, seamless content creation and management experience. The evidence of this can be seen in the flatter, more simplified design of WordPress releases 3.6-3.9. And most recently, in WordPress 4.0, we’ve seen WordPress finally take a crack at some major improvements to their post editor. It’s not quite a slick as Ghost yet but it looks like the new direction of the WordPress admin is much simpler and more intuitive. 2. Which platform is best for bloggers who may one day want a full website/CMS? It would seem that this one would clearly go to WordPress. However, it is possible to install Ghost on a subdomain of a WordPress website. Which means it’s possible some may choose to start out as a Ghost blog and grow into a full website. And when that time comes, they will expand with WordPress. Personally, I think WordPress has the distinct advantage in this category. I know I don’t (and probably will never) prefer to jump between two platforms for one website. I love having it all manageable from one admin and when it comes to that WordPress is without a doubt the big winner. 3. And finally, which platform is best for existing websites (WordPress or not) who also want to have a great blog? There are a great many website building platforms out there that may or may not be as good at blogging as Ghost or WordPress. If someone has an existing site built on one of these platforms and is looking to add a new blog or improve their current blogging experience I think it might actually be a toss up between WordPress and Ghost. Perhaps with a slight advantage to Ghost (in the long run) if they maintain their simplicity and yet mature enough to offer everything a serious blogger wants out of a blog. 1. WordPress is easier to install on most hosts as many hosting services do not yet offer one-click installation for Ghost. This is both a large and non-issue for Ghost right now. It’s a large issue because the perception of what is most likely their largest target audience–people on WordPress who want a simpler blogging experience–are used to the self-hosted install being the one with the most power/flexibility. As long as that perception persists (while simple installation is not an option) the rate of new users is likely to stymie. However, it’s actually a non-issue because the Ghost(Pro) service is not like WordPress.com–without access to most themes/plugins/etc.–it’s actually more along the lines of a service like WPEngine or other managed hosting options. If Ghost can educate people about this important distinction they will probably begin to see wider adoption. 2. While the backend experience for Ghost is beautiful, extremely simple, and easy to use (easier than WordPress, for sure) the quality of theme design for the front-end on Ghost is currently lagging behind in a big way. Even those who want a simple yet effective blogging theme might be hard pressed to find one for Ghost that isn’t over-simplified to the point of looking amateurish or “tumblr-esq”. 3. And finally, even though many of the biggest developments in recent years–across the entire WordPress ecosphere–have had nothing specifically to do with blogging, there are still way more tools for bloggers to use on WordPress than their are on Ghost (at the moment). The unfortunate reality is that even though it’s been over a year since Ghost launched on Kickstarter (and even longer since O’Nolan published the concept) it’s going to take a long time for it to make up the ground on WordPress that it needs to before it becomes a serious contender–even just as a blogging platform. Ghost can try to be a blog only platform, but you need all that extra power WordPress plugins bring to the table to really get the most out of a blog. simple to install feedburner and disqus (even in tumblr, disqus needs to be set up and installed), as well as static pages and beautiful free themes , alongside out of the box SEO and the social sharing — it IS a powerful blogging platform. WordPress is bloat. I’ve used it for years and wanted something to simply BLOG on. Write and express ideas while having a great looking package to display that in. WordPress is hardly for just bloggers anymore. I just installed ghost on my server and I have no idea what I’m doing. Well, that could be said about my wordpress abilities but that’s besides the point. I stick with wordpress for now. Nice write up though. I have very often in the past few months grown weary of the constant babysitting demanded by a WordPress site. I have longed for a blogging-only platform to which I could easily shift my present content with something resembling broadly similar template looks, and just write and publish my stuff. I own three blogs which could function quite well on a blog-only site. I first thought I’d just slip back to wordpress.com but then I found out that: (a) there is as far as I can find no easy way to migrate the content; and (b) they charge a fair amount of money (particularly when compared to tools that let you build sites AND blogs in one sitebuilder package). Back in the day (yeah, I’m old enough to get away with saying that!) when Dave Winer and Radio Userland (and its followon, Manila) were around, blogging was easy from web and desktop. I’m going to check out Ghost (though it sounds like it’s a ways from being ready for prime time). Thanks for this good piece and for the links you provided for further exploration. This blog has become a staple of my WP life. WordPress.com is fine for a basic blogging platform if you want limits on the themes you can use and limits on the customizing you can do to the theme. You really need a self hosted wordpress blog imo. 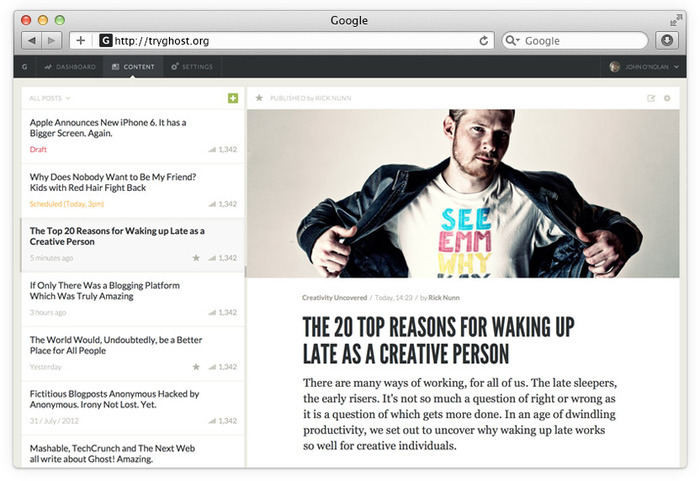 Ghost is still too far away as a blogging platform. I switched my blog from WP to Ghost a while back after trying to install on several hosts I moved to the ghost.org.io platform the markdown thing was what got me excited and I wish WP had this feature built in. It’s also simple to update and I focus more on blogging than messing around with plugins and such. You just login and start writing I really enjoy this and I think that part of the pull for most people. Themes are getting better but it’s not at the WP theme stage by any means. I think Elegant Thenes should make a theme or two would love to see that. Sunflowerthemes from Themeforest does some great themes. Going through marketplace right at ghost.org, even many of the premium themes are less than ten dollars. I’m using the free perfetta and love it. Easy to just make tweaks and and then rezip and reupload it at ghost.org – though now Im self hosting at asmallorange. 5.oo/month and was a one-click install. I totally agree with just logging in and writing. It’s a breath of fresh air. Happy Blogging! This is the first I’ve heard about Ghost so I’ll have to take the approach of the article at face value. But, if I understand it correctly, the reason for Ghost is to have a simplified blogging experience. What I don’t understand is how someone could suggest that there is a “gap” in the market for that. There are many cloud hosted solutions such as Tumblr, Blogger, TypePad, etc. Why would a simplified experience include something that is self hosted? I mean, if you’re going still have to buy a hosting plan, make regular backups, secure the site from hackers, and all the things that go along with self hosting, how is a simplified blogging component going to make the entirety of it simpler? Unless I’m missing something, shouldn’t Ghost really be a WordPress plugin that achieves the usability needs of the “blogging only” users? Or maybe I’m being narrow minded. No, I think you’re identifying the limit of Ghost’s potential popularity. There are only so many blogging-only publishers who are also tech savvy enough to set up a self-hosted version, willing to write in Markdown, and want to willingly forgo WP’s bells and whistles in favor of a more refined admin design. Ghost is a cool app, don’t get me wrong, and I hope it finds its niche. But I don’t see it being any more than a niche. Never try Ghost, use WordPress from last four years. It’s so flexible and easy to editable. The main plus point of WordPress, is it’s free and premium plugins. Nice pitch, many promises, but: did anyone out there tried to simply understand what the hell they are saying in their literature or just install this thing? I did and never succeeded in neither understanding a single word of this hype bs nor install their code. Let’s see if anyone will still even mention this in 2-3 years from now when the dust settles. I am happy to stick with WordPress, it just keeps on getting better and easier to use. Also I don’t see any problem with Automatic making a profit, everyone should be allowed to make a living. Any easier way to make a website rather than write code, any code at all will be welcome for us the Designers Code-Writing-Challenged. I have been using WordPress seft hosted for 5 years, and I think that is the most easily platform you can use for blogging or even out of blogging. Im choose WordPress, WordPress better for anything, but if only for blog platform, i use HTMLy — php, no-database, speed and awesome, old fashion. I’m a little surprised by this line, as WP’s main advantage over its competitors over the years has been that the admin was way easier to manage (just look at Drupal). It’s definitely starting to show its age now compared to some fancy new apps that are more targeted, but it still has the user-friendliness edge over other general-purpose CMSes. I think the best way to understand that line is within the context of “just blogging”. So if you’re someone who is happily blogging away on, say, tumblr and you’re considering the switch because you’ve heard WordPress is more powerful and flexible as a blogging platform–you would have a legitimate gripe in saying that WordPress, for the pure blogger, is a bit overcomplicated. That’s not to suggest that WordPress as a CMS is not actually much simpler and easier to use than its competition in that arena. The way I look at it is from the standpoint of running a multi-author site on a self-hosted WordPress install. I offer low-commitment opportunities for people to contribute on our topic and I run into the same problem with every new writer I sign up: they can’t make heads or tails of the admin. I’ve used WordPress since 2007 for a variety of sites that all generally aimed to be operated more as a CMS than a blog, per se, and that’s my only complaint so far. Sure, I’d like to see many features in the core to prevent plugin bloat (extremely easy pitfall with WordPress), and I find myself often dealing with unnecessary steps to get something done in WordPress, but I know how to navigate a complex administration and code things to my liking, front or back end. My experience and skills mean nothing to a new writer with no design/coding ability to speak of. They still have to navigate the software to create a post and they have to learn how to do that on their own. Plugins that let you remove elements from the back end that are obviously of absolutely no use to the writers help a great deal, but then it’s also more plugin bloat that slows the WordPress admin down more than it already is. That said, there are so very few options out there to accomplish the same thing, so I have a love-hate relationship with WordPress. I will try Ghost out on some local and smaller projects and see what it has to offer. In some areas, my expectations are very low and easy to meet. We will see. Nice post. I have several blogs/ sites from self-hosted WordPress to WordPress.com, Tumblr, and Blogger. I actually tried Ghost. I did the 30 day trial with the Ghost.io domain and also I tried a self hosted blog on Digital Ocean. Node.js is really quick and seems low maintenance, but I really only see a niche or a market for blogging snobs. I actually think that Tumblr, WordPress.com, Blogger, and Medium are probably more direct competitors than a self-hosted WordPress. If your trying to market to people who just want to blog then the majority of your market will choose a free option. Ghost costs $10 a month for 1 blog or $5 if you run one over at Digital Ocean. I chose Digital Ocean because you can’t run node.js on shared hosting at this time. Because your essentially managing a server when you host anything on Digital Ocean there will be a learning curve which means that it’s not just about blogging at that point. For the lack of features and development I consider $5-10 a month overpaying, but I do like the platform. It’s just too expensive and experimental for me at this point. Maybe one day I’ll take another look at it. Nice article. I love WP and my main site (http://discerne.com) is a full e-commerce/LMS running on it. It’s self hosted in Digital Ocean. I learned everything in it by myself, at start a little frustrating but now, more than 2 years of experience, it’s totally fun. As my site grows, I’m thinking more and more to make a another WP install just for my site’s blog (toad ays’ just a page inside my WP site). It happens that my main WP install is becoming so complex, and the blog simply doesn’t needs that complexity. Maybe that’s what Ghost is for: a good blog, but not a complex one. In some way, WP birth as a blog tool made it a little strange to become a full feature CMS. Now that WP is that CMS, it’s a strange blog tool. Said that, I choose Ghost to make my personal blog (http://www.csfalcao.com, I used a 1 click install from Digital Ocean). It’s so simple and write focused UI. I like so much to see the text rendered while I write, and have no plugins to manage. Ghost is in it’s infancy (0.5 version) and it lacks a lot of features (SEO, dashboard, widgets, comments …) but it’s so fun and not distracting. Of course, Node.js is *instantaneous* speed. That’s a thing that a miss from WP’s PHP: easily get a speedy setup. Ghost’s speed is crazy-fast compared to WP out of the box. Keep in mind that Ghost is only on v. 0.5 and WP just released v. 4. I think when that ground is made up, Ghost is going to be a formidable competitor in even more ways than we can currently compare, but of course it’s going to take time. Ghost has a competitive advantage in its agility. What a wonderful piece Nathan, thanks so much for going into so much detail and researching every bit so thoroughly. I think this is quite easily the best post I’ve read comparing WordPress and Ghost (and believe me, I’ve read quite a few). You’re spot-on with regards to an overall lower quality in the theme market for Ghost right now. We’re still waiting for an early innovator to come along and push that forward in the same way the WooThemes and StudioPress did in the WP market all those years ago. I think there’s a big opportunity there. We’re still at a very early stage, but I’m really excited about the direction which both platforms are going in. I have no doubt that we can both push each other to make the entire Open Source ecosystem better over the next few years, and that’s good for everyone. This is an excellent blog post! Extremely well thought out and researched! I don’t believe I’ve seen a better article about ghost. 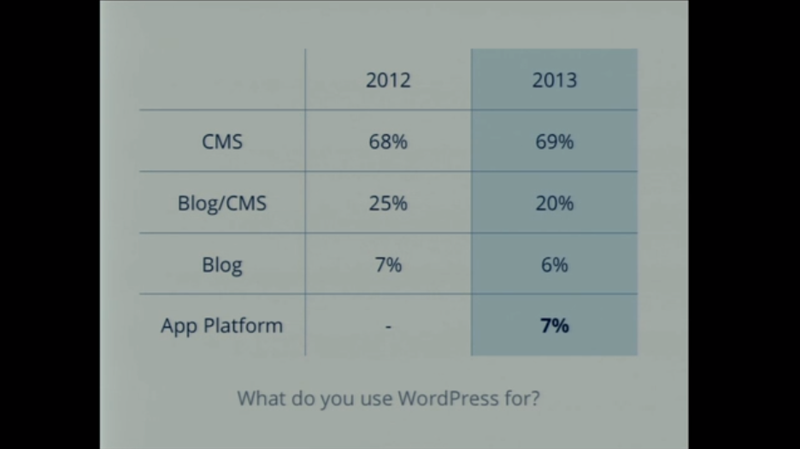 I really think the time has come to stop comparing WordPress to Some-Other-Platform. These always end in “you have to decide for yourself” because there’s no definitive answer. I love WordPress and will continue to use and develop with it. 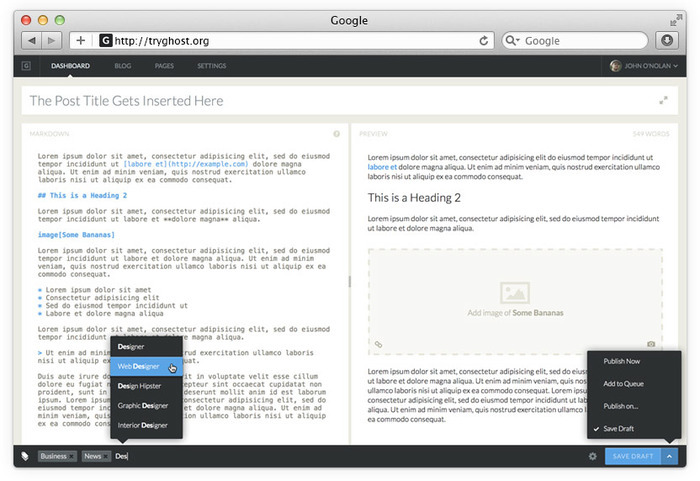 That said, I also like Ghost, Habari, and as of yesterday I’m trying out “JustWriting,” a new markdown blogging tool. My mantra: Always play with multiple blogging and CMS tools. Installs aren’t rocket science and you just might be surprised what you find along the way. I’ve been a WordPress user for 10 years, and to be honest, it was a breeze to implement without having a great deal of technical experience. I attempted to install Ghost and gave up, the instructions are written for developers, rather than publishers like myself. Almost all open source software in the world start with a “focus” but eventually transform into bloatware. As people start using it they’ll become more accustomed to it and start demanding more features. Finally it deviates from its “focus” and newbies find it unsuitable. So someone forks it and begins from square one proclaiming it achieves what the original app intended to do. A vicious circle. You seem to be biased toward ghost, while still using wordpress. But that is just what impression you left over me, and I might be wrong. – No categories and sub-categories: you have tags in the lastest version which works as categories. But you can’t for example have a sub category. I like how you can manage and organize your posts under certain cat and sub-cat. And I hate the lack of in ghost. – No related posts at the end of the post. A plugin or something would be amazing instead of manually putting links at the bottom of the post. – No comments, you have to hack your template and include some comment service system, such as disqus and analytics (not sure if already works in the last version of ghost). – Uses node.js, but this is not a thing to care if you don’t change the server code. Even in tumblr you have to ‘hack’ and insert disqus code or any other code if you want things to appear in your blog. Yet tumblr has totally taken off. The ‘hacking’ for ghost is simple – open your default.hbs and drop in a few lines of code from feedburner/mailchimp if you want email subscriptions, or a few lines for disqus (tho some themes already have disqus and you just need to put in your username) there are other commenting systems able to be implemented with similar ease, like Muut. As far as adding in related posts – same thing, open default.hbs drop in some code from LinkWithin — works no problem. Yes ghost.org charges 10/month – though that goes back into the continued development of Ghost. There is also ghosted.it and runkite.com (and others) that are only 5.00/month. It might not be for everyone, but I think it definitely is perfect for many. I’m looking for a diary platform, and have just tried Ghost. I like the simplicity and basic feature set. Users, Tags, and Markdown (with showdown) for authoring posts. Automatic feeds are nice. Some of the UI is a little awkward. Navigation can be tricky also. There is on out of the box search, and no comments system. You could fix these with some template edits and the addition of third party services. I’m left thinking what do I actually get with Ghost over say a static html site generator (markdown pushed into templates). Currently not that much. Really interesting article – Having worked with WordPress for the past 4 years or so now I love it however with the advent of Node I made a jump to Ghost on my personal blog http://dylanscott.me. So far I love distraction free writing and it keeps me focused on my main goal – a blog. I do miss some of the features of WP but I realise these are just distractions from a sole blog purpose. For larger scale things like management of full sites WP all the way. I’ve been using Ghost for my blog, http://www.devanpatel.me, about 5 months now after switching for WordPress and I am happy that I did so. Like many others say, WordPress has a lot of bloatware that is just not suitable for personal bloggers that want to just express their opinions or technical expertise. For bloggers who have just gotten started, which blogging platform they should choose is one of the most confusing decisions they have to make. Usually, bloggers have three top options to choose from, namely Blogger, Tumblr and WordPress are the top choices. Seriously, Ghost is hard to install? Just go to DigitalOcean.com, set up a new SSD server for $5/mo, and under ‘Applications’ have it install Ghost. After you adjust your nginx and Ghost config – everything works fine. Unfortunately the server images contains just default config values for the hostname. Ok seriously! Ghost is so cool! for a blog, it’s a must must have! Since the article was published, Ghost grew up in a very nice way! I have to say that I’m working with WordPress more than 9 years and I still love it. My problem with WordPress in the last three years was that I lost the focus with WordPress as a blog platform and used WordPress more and more as a CMS and marketing machine with many, many 3rd party or own developed plugins. Even my own blogs are full of unnecessary plugins, theme extensions and more. Many years ago I tried Ghost but it wasn’t really nice for me so I put it aside. Few years ago I checked out Medium and it was and is still a very handy way to blog. Unfortunately Medium doesn’t provide a custom host-/domain name or maybe (like Ghost) a self-hosting version of itself. Otherwise I would use Medium until now. As soon as Zelda will be released, I will move my WordPress blogs a.s.a.p to Ghost. Robin, I hear you for the unnecessary third plugins for WordPress part. I had the same problem. This article is great btw and since i’ve fairly used both WP and Ghost over the years, last month I decided to try something new: PencilBlue. It is an open source content management system built on Node.js. PencilBlue according to their website is developed to utilize a plugin system that can modify and extend even the platform’s core functionality. Which was awesome for my needs. I will do a write up about the differences between Ghost and PencilBlue as soon as I explore Pencil Blue to the fullest. I haven’t tried Ghost yet, but I will have to after reading this. As for me. wordpress is much better blogging platform as ghost. I’ve been looking for the right article that differentiate these two: Ghost vs WP. Yet found it here… Well done, Nathan. Images on this article are broken. One thing that isn’t taken into consideration is the resource cost of running each service. Naturally php uses a lot more resources than node.js. if you want a fast lightweight and cost friendly site then ghost of the obvious choice.